An EAPS assistant professor of atmospheric science is the subject of a recent publication; but I’m not talking about a journal article. I’m talking about a science book for elementary school children in grades five through seven, one that features role models in the sciences. 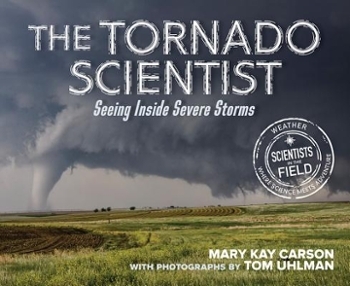 The book, titled The Tornado Scientist: Seeing Inside Severe Storms features one Dr. Robin Tanamachi, and follows her path to becoming a scientist, from her childhood interest to her current research, and includes scientific facts aimed at engaging young readers. Dr. Tanamachi says this combination is exactly what interested her when she was approached about serving as the subject. The book, written by Mary Kay Carson with photos by Tom Uhlman, is part of a larger series that aims to interest that same age group in several of the sciences, including astronomy, aeronautical engineering, and biology. Carson said that Dr. Tanamachi’s work, combined with her enthusiasm for the project, made her an excellent choice for the book. “Dr. Tanamachi is someone who values science communication to the public,” Carson said. “It takes time, effort, and patience to coordinate with photographers, explain radar principles to a biology major like myself, review manuscripts, and answer endless emails. Dr. Tanamachi understands that the next generation of scientists are being inspired by who they see as scientists in the media. That includes books." This spring, the pair will accompany Dr. Tanamachi on a weeklong field research excursion as part of an undergraduate course at Purdue, documenting activities with a new, updated radar and student interactions on a live blog in support of the book. This activity is supported by a grant from the National Science Foundation. Having the class field trip professionally documented also allows Dr. Tanamachi, her co-instructor Dr. Daniel Dawson, and their students to concentrate on data collection and training students. The book is published by HMH Books for Young Readers.